Lucinda Williams’ contribution to the campaign season is a fantastic live EP featuring three covers of classic protest songs and one new original. Buffalo Springfield’s “For What It’s Worth”, “Masters of War” by Bob Dylan and “Marching the Hate Machines” written by Thievery Corporation & the Flaming Lips, were recorded live in Greensboro, NC. Lucinda’s new “Bone of Contention” was recorded in Milwaukee, Wisc. The beautiful rawness of the stripped down, plug it in and fire it up live band showcases the power of these timeless songs of protest, allowing you to feel their meaning come through as you channel the spirit of the sixties. All without the aid of acid, bell-bottoms or body odor. It makes you want to stand up and say, “Hell No! I won’t – do whatever it is the ‘man’ is making us do these days”. It inspired me to vote early and volunteer. Hell, a guy cut me off in traffic and I shot him the peace sign instead of the bird. Doug Pettibone’s signature guitar tone and perfect touch is moving and haunting on these tracks. Pettibone and former Eels guitarist Chet Lyster are joined by David Sutton on bass and Butch Norton on drums. 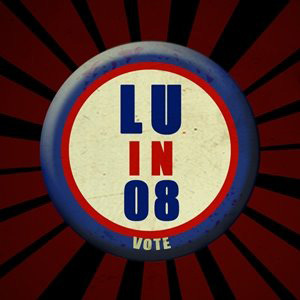 LU in 08 was produced by Tom Overby, who also produced Williams’ 2007 CD “West”; this EP truly captures Lucinda’s live vibrance and energy.